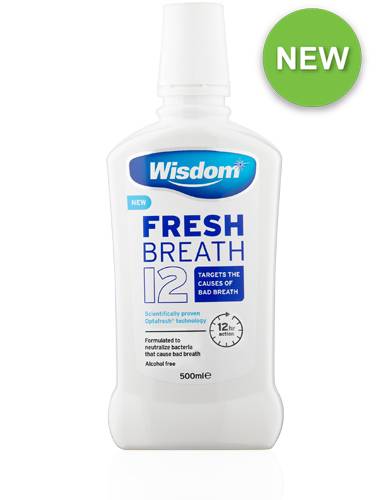 Wisdom Fresh Breath 12 has been specially formulated to target the root causes of oral malodour, commonly known as bad breath. The unpleasant odours associated with bad breath are caused by gasses known as volatile sulphur compounds (VSC’s). Wisdom Fresh Breath 12 mouthwash targets the bacteria that creates VSC’s as well as the VSC’s themselves. The triple action formula with Optafresh® technology works for UP TO 12 HOURS to ensure long lasting, fresh breath confidence. Use twice daily after brushing, morning and evening or as required throughout the day for long lasting fresh breath. Ingredients: Aqua, Sorbitol, Glycerin, PEG-40 Hydrogenated Castor Oil, Aroma, Potassium Citrate, Cetylpyridinium Chloride, Sodium Fluoride, Chlorhexidine Digluconate, Sodium Saccharin, Citric Acid. DO NOT SWALLOW. Keep out of reach of children. Not suitable for use by children under 12 years of age. Discontinue use and seek immediate medical help if you experience any of the following: a rash, swelling of the mouth or face, or have difficulty breathing. These effects may be symptoms of an allergic reaction which is very rare. Use of this product may temporarily discolour teeth, this can be removed by twice daily brushing or by your dentist or hygienist. You can help avoid staining by not drinking tea, coffee or red wine, especially up to one hour after use.